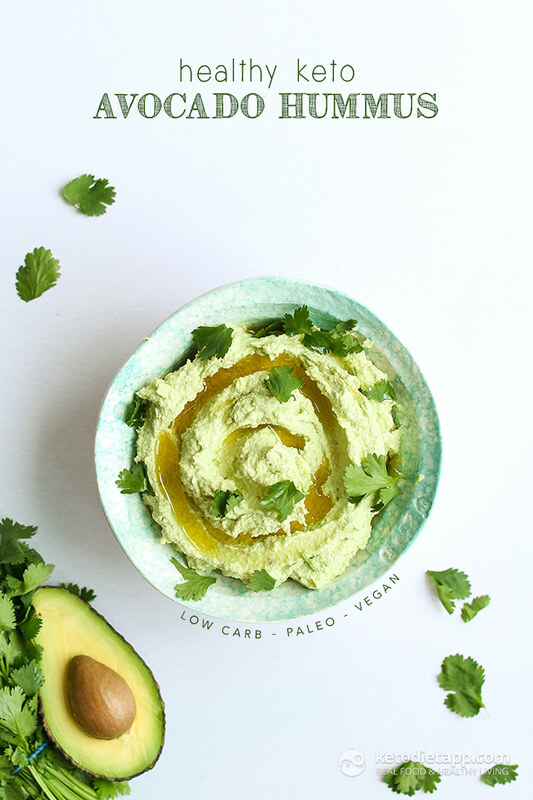 This tasty keto & paleo hummus combines some of the healthiest fats from avocado, macadamia nuts and extra virgin olive oil - all of these ketogenic foods are fantastic sources of heart-healthy monounsaturated fatty acids. 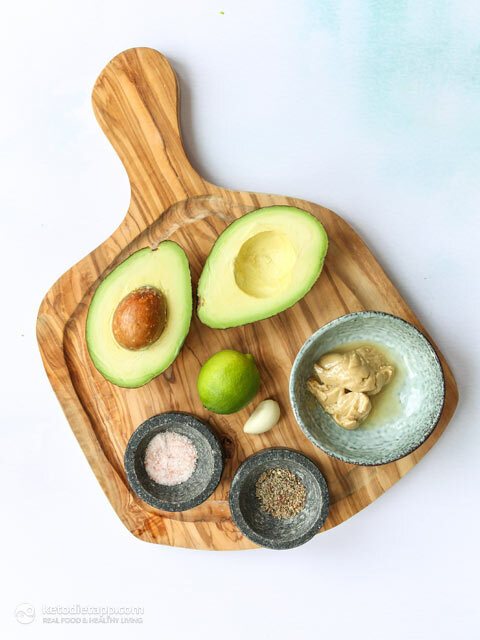 Avocado and macadamias are also high in electrolytes, especially magnesium and potassium. You wouldn&apos;t believe how well soaked macadamia nuts work in hummus instead of the traditionally used high-carb chickpeas! I served mine on top of baby sweet peppers, jalapeños and celery stalks. You can even serve them with freshly chopped carrots - just watch out for the extra carbs and stick with 1 to 2 carrots per serving. 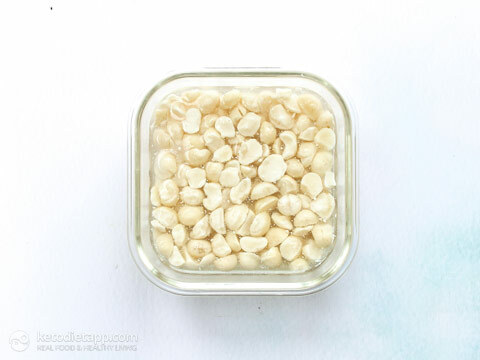 Place the macadamia nuts in a container and fill with filtered water until they are submerged. Soak at room temperature for at least 2 hours or overnight. Strain and rinse the macadamia nuts after soaking and discard the soaking liquid. Peel the avocado and remove the seed. Peel and slice the garlic. Optionally, add fresh cilantro. 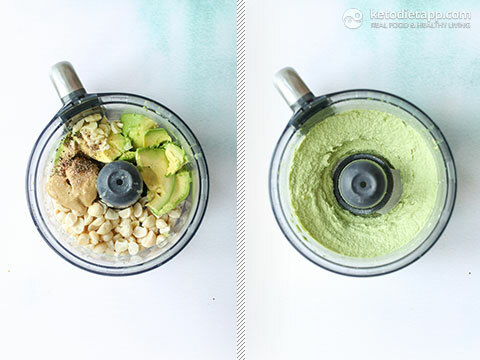 Place all the ingredients into a food processor and process until smooth. Transfer into a bowl and drizzle olive oil on top. Garnish with more cilantro leaves. Serve with freshly chopped vegetables such as peppers, celery sticks and carrots. Store in an airtight container in the fridge for up to 5 days. Martina, I was missing the calorie count...I found it. Sorry about that! I'm in the process of making this, it looks sooo delish! I didn't see a calorie count though? Am I missing it? Looks great ! Can we substitute macadamia with any other nut ? You can use blanched almonds (these will take longer to soak, Id soak for 4 hours) or cashews (same soaking time as macadamias but beware of extra carbs and avoid for strict keto). I hope this helps! This looks great! How long would it last? Thank you! I would say up to 5 days but best eaten within 3-4 days. It can be frozen for up to 3 months. Oh my just made this and it is deliciousness!!! 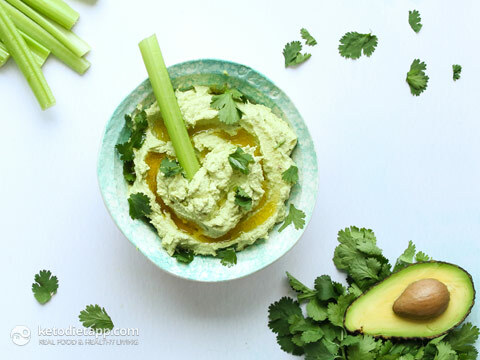 I like it better than hummus made from chick peas! Is it possible to leave out the tahini? I'm allergic. Tahini is used for taste (makes it more like traditional hummus) but you can either replace it with a handful more of macadamia nuts or an equivalent amount of almond butter. 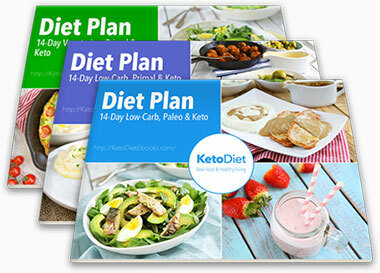 It will not taste the same but nutritionally it will be very similar.